Martin Riesebrodt's unconventional study provides an extraordinary look at religious fundamentalism. Comparing two seemingly disparate movements—in early twentieth-century United States and 1960s and 1970s Iran—he examines why these movements arose and developed. He sees them not simply as protests against "modernity" per se, but as a social and moral community's mobilization against its own marginalization and threats to its way of life. These movements protested against the hallmarks of industrialization and sought to transmit conservative cultural models to the next generation. Fundamentalists desired a return to an "authentic" social order governed by God's law, one bound by patriarchal structures of authority and morality. Both movements advocated a strict gender dualism and were preoccupied with controlling the female body, which was viewed as the major threat to public morality. Martin Riesebrodt is Associate Professor of Sociology at the University of Chicago. Don Reneau is a translator based in Berkeley, California. "Riesebrodt's trenchant analysis brings the comparative study of religious activism to a new level of sophistication, exploring not only the ideological development of fundamentalist movements but also the changes in social structure that produced them. 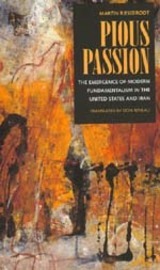 Pious Passion is a signal event in the modern social sciences, for it helps to establish a new academic field—the comparative study of fundamentalism. "—Mark Juergensmeyer, author of The New Cold War?